Great views of Lake Arenal and the Tilaran Mountain Range along the way. Los Pumas Rescue Center visit. Service guide and small groups to assure adequate attention during the tour. We begin the ride in comfortable mini-vans from La Fortuna towards Guanacaste, known as the Chorotega Region of Costa Rica, home of the dry tropical forest. We will drive around the scenic Arenal Lake, renowned as the largest lake in Costa Rica, and considered a RAMSAR location of great hydroelectric importance; and in the small towns of Tilaran or Nuevo Arenal, we will take a short restroom break before continuing our journey. Once we arrive in Canas, we will visit the Los Pumas Rescue Center, a non-profit organization whose goal is to counter-effect the damages done by hunting, deforesting, and maintaining wild animals as pets. The idea of our visit is to learn about the importance of conservation in Costa Rica, and have the opportunity to see different animal species which have been rescued and taken to the Center, where the intention is to rehabilitate them and release them back into their natural habitats. You will see a large variety of felines, wild birds, and some other mammals like monkeys and deer. After learning about the conservation programs, the maintenance of these wild animals, and a bit of environmental education we will be ready to head to the shores of the Corobici River for a delicious lunch, in a restaurant surrounded by nature and incredible views of the river and the Tenorio Volcano. After lunch, we will drop you off in your hotels in the different destinations of Guanacaste including Liberia, Tamarindo, Conchal, Flamingo, Coco, Papagayo, Hermosa, and other beaches of the area. Transportation from your hotel in comfortable late model mini-vans with air conditioning, free Wi-Fi, professional driver (service guide), bottled mineral water, Los Pumas Rescue Center visit, delicious lunch on the banks of the Corobici River. This requires a minimum of 4 adults. Child Price applies for 5 to 11 yrs. of age. All children must use a car seat or booster seat. Please request at time of reservation, for no additional cost. Bilingual Tour (Spanish and English). Vegetarian Option available, please request at time of reservation. Transportation is included from most hotels. If your hotel is located far from La Fortuna or the main road to the Arenal Volcano, please ask about possible additional charges. Times are approximate, an exact pick up time will be sent with your reservation confirmation. Drivers can wait no more than 10 minutes for travelers, after which time the reservation will be treated as a no show and charged in full. We allow 1 pc of luggage and 1 carry on per person. Additional luggage $10 each. We reserve the right to cancel or modify our services for reasons such as natural disasters, accidents, mechanical failure, etc. Daily departures from La Fortuna, Jacó & Manuel Antonio. 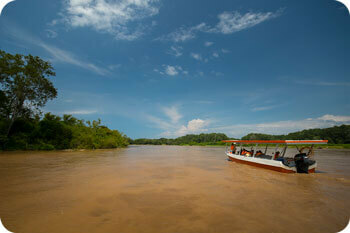 Boat ride bordering the shores of the Tárcoles River which boasts the largest Crocodile population in Central America. Possibility to observe countless species of birds like roseate spoonbills, red macaws, cormorants, herons, ospreys and more. Dedicated driver. Small groups to assure excellent personalized attention. Apt for all type of person. From La Fortuna, we will head towards the Pacific Coast in comfortable late model mini-vans, with the opportunity to cross the famous Rio Grande of Tárcoles, which boasts the largest American Crocodile (Crocodylus Acutus) population in Central America. During the drive, we will make a short stop in San Ramon for bathroom breaks and a cup of coffee before continuing our journey. Once we reach the beautiful Hacienda Nosavar we will board a tractor-pulled wagon for about 20 minutes through the Hacienda to the shores of the Tárcoles River. We will then board safe and comfortable boats in the wetlands near the Carara National Park, which is renowned for its significant Scarlet Macaw (Ara macao) population. We will travel 1.5 hour boat ride through the mouth of the river and along areas near the sandbanks where we can observe aquatic birds like kingfishers, herons, pink spoonbills as well as incredible crocodiles over five meters (16.5 ft) long, all in their natural habitat. Afterwards, we will enjoy a delicious buffet lunch before returning to the van to continue our trip to the beautiful beaches of Jacó and Manuel Antonio. Comfortable clothes, insect repellent, binoculars, sunscreen, camera and money for snacks, tips, or souvenirs. Transportation from your hotel in modern minivans with A/C and WiFi in route, bottled mineral water, Crocodile Tour in the Tárcoles River, Naturalist guide, and buffet lunch at Hacienda Nosavar. This tour requires a minimum of 4 adults. Minimum age required: 00 years. Price for child’s: 05 – 11 years. Child’s from 00 – 04 years are free. Every child must travel compulsorily on baby chair or booster. It must be previously requested and don’t have additional cost. May be operated by a multilingual guide (English and Spanish). Transportation included from most La Fortuna hotels. If your hotel is far from downtown La Fortuna or the main road to the Arenal Volcano, extra charges may apply, please ask. The departure times are approximates. Your exact pick-up time will be sent in your reservation confirmation. The driver will wait for clients for 10 minutes, after which time if the client has not arrived, the driver will leave and the reservation will be charged in full. 1 piece of luggage and 1 carry on are permitted. Additional luggage is charged at $10 each piece. We reserve the right to change or cancel our services for reasons out of our control, like accidents, natural disasters, mechanical failures, etc. Delicious Lunch with an amazing panoramic view of the Hule Lagoon. Guide for the service. Small groups to ensure excellent personalized attention during the tour. We depart from San José towards la Fortuna at San Carlos through the mountains of the Cordillera Central in our modern and safe microbuses. During the transfer we will be passing by towns of cloudy areas as Poasito or Fraijanes, where we will stop for the use of toilets and if you want to buy and taste delicious fresh strawberries from the region. After this, we will continue the route to Poas Volcano National Park known for locating the volcano as one of the largest craters in the world and considered as one of the natural wonders of the country. In the National Park tour we will have the opportunity to see the main crater if it is clear, moreover we will learn about the typical forest of the region known as “Bosque Nuboso” making it one of the main attractions on site; if you run into luck we will observe some species characteristic of this forest like rabbits, squirrels, birds, peccaries, amphibians, reptiles and lots of plants of the area such as bromeliads and orchids. Once we have finished the tour in the Park, we will take the route to Vara Blanca admiring some natural sceneries as La Paz waterfall until we reach to the town Pata de Gallo, where is located the impressive Hule Lagoon known for its vast 55 hectares of extension and the variety of scenery. Right there, we will savor a delicious traditional Costa Rican lunch while enjoying the panoramic views of the Hule Lagoon where we will learn about its formation and other interesting details. After lunch we are ready to continue our ride toward La Fortuna at San Carlos where the majestic Arenal Volcano is located. Light clothing, rain coat, sunscreen, camera and money for snacks, tips or souvenirs. Transportation from the hotel in comfortable and modern microbuses with air condition, Guide for the Service (professional driver), Wi-Fi in route, bottled mineral water, Poás Volcano entrance fee and delicious lunch with panoramic view of the Hule Lagoon. Minimum age required is: 00 years old..
Rate for children: 05 to 11 years old. Children from 00 to 04 years old are free. Rates per person (USD). Children must travel in a child seat or booster. It must be previously requested and does not have additional cost. Bilingual tour (spanish & english). Vegetarian option is available, please advise at the time of your reservation if is required. Transportation is included in most hotels, if your hotel is too far from La Fortuna town or too far from the main road to the Volcano will have an extra charge for transportation, please consult it in advance. The time described is approximate, the exact pick up time will be sent in the confirmation booking. The driver will wait for not more than 10 minutes, in case that the client doesn‘t show, the reservation will be charged to 100%. It is allowed one suitcase and one handbag per person. Extra luggage: $10 per unit. We reserve the right to modify or cancel our services due to unforeseen circumstances as accidents, natural disasters, and mechanic failures, among others. One of the safest and most comfortable ways to travel through Costa Rica is with a private land transfer. You choose the date, the time, and where you wish to go, be it a hotel, restaurant, airport, rental home, or anywhere else you desire. Our fleet of modern comfortable vehicles is complete with professional drivers, with years of experience in transporting tourists. They will be able to guide you and serve as support throughout your journey through Costa Rica. Included in your Service, you can enjoy 1 hour of wait time at no charge. This means you are welcome to request a stop for breakfast, lunch, or dinner, to take photographs, use restrooms, stretch your legs, or just take in the magnificent scenery. We can also help you coordinate activities that are near your chosen route and combine them with your private transportation, for an additional charge. 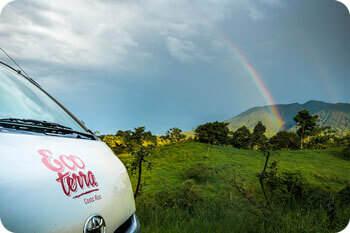 Ecoterra Costa Rica is not responsible for lost or forgotten luggage in our minibuses. Children must compulsorily travel with baby seat or booster seat. Must be previously requested and don’t have additional cost. The pets transportation is not allowed unless required for reasons of disability. We reserve the right to modify or terminate our services by force majeure such as accidents, natural disasters, mechanical failures and other. This means of shared transportation is one of the best options to travel through Costa Rica if you are on a budget. With Ecoterra Costa Rica you can travel comfortably in one of our mini-vans with a professional driver, air conditioning, and Wi-Fi, enjoying this incredible experience of crossing Costa Rica by land. Our Shuttle Service allows you to share a mini-van with a small group of people which are heading to the same destination. The shuttles are available daily and go directly from destination to destination. This service has set schedules, is subject to availability, and is recommended that you reserve in advance. We offer shuttle transfers to most every destination in Costa Rica. The service includes hotel to hotel pick up and drop off, allowing you to be picked up or dropped off at the airport or the hotel of your choice as long as it is within the covered service area. Children rates apply for children under 09 years, who must compulsorily travel with baby seat or booster. Must be previously requested and don’t have additional cost. It allowed one suitcase per person + 1 hand luggage. Extra Baggage: $ 10 per unit. Many travelers consider driving in Costa Rica because it is an adventure, its mountain roads, panoramic views, and highways are all part of that adventure. Renting a vehicle is a good idea for those who prefer freedom over depending on transportation schedules, and for those who wish to visit attractions that are a bit off the beaten path. We offer different types of rental vehicles including automobiles, 4×4 SUVs, and minivans. 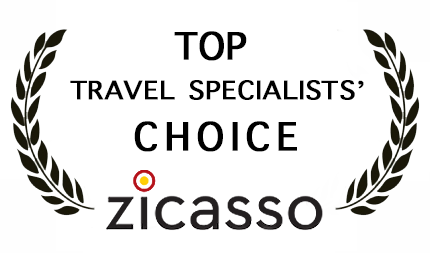 Choose the best option for your tastes, budget, group size, itinerary, and luggage space. Ecoterra Costa Rica Works with Adobe Rent a Car, the best car rental company in the country. There are offices located throughout the country, including the Juan Santamaria International Airport in Alajuela and the Daniel Oduber International Airport in Liberia. The vehicles have GPS, the best full coverage insurance, modern vehicles, and special rates for our clients. Fly anywhere in Costa Rica in just minutes. Save time, enjoy the incredible views of the mountains, rainforests, waterfalls, valleys, volcanoes, and beaches from up above, while avoiding bad, windy, mountain roads. We offer you the option of flying to your next destination with domestic flights that will help you make the most of your time in our country. Our air transport provider is Nature Air. They have airplanes with panoramic Windows so you can take amazing photographs, making your trip to your next destination a tour in and of itself. The distance from La Fortuna to Monteverde is considerable, with complicated Access. There are only 2 possible ways to travel between these popular destinations; in a private transportation, driving around the Arenal Lake, which takes around 4 hours, or with the Car Boat Car service which takes about 2.5 hours. The Car Boat Car consists in a private or collective transportation option in which you will be picked up right in your hotel in the Arenal and La Fortuna area. We will drive up towards the Arenal Lake where we will board a boat to cross the lake, observing along the way panoramic views of the Arenal Volcano, Chato Hill, Arenal Lake, the Tilaran mountain range, and more. Once across the lake we will again board a minivan to continue on to Monteverde and the hotel of your preference. This drive is about 1.5 hours. Children rates apply for children under 09 years, who must compulsorily travel with baby seat or boaster. Must be previously requested and don’t have additional cost. Ecoterra Costa Rica is not responsible for lost or forgotten luggage in our minibuses or boats.